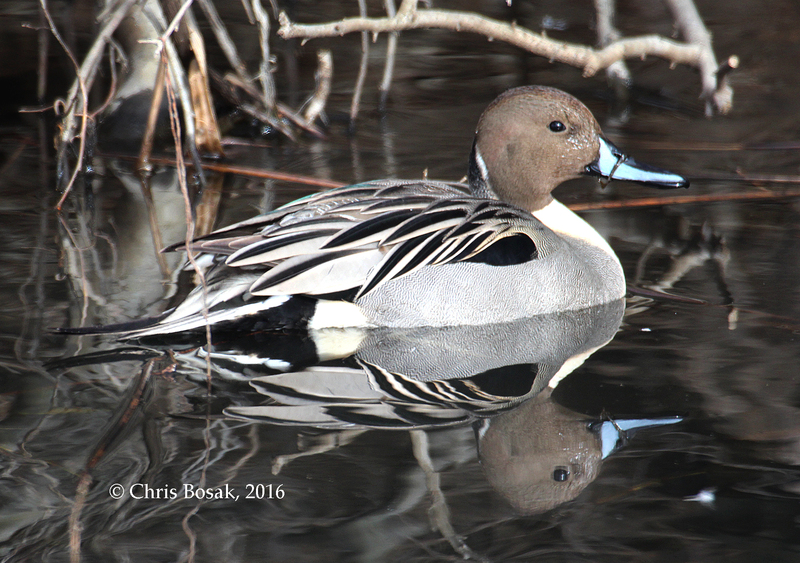 A Northern Pintail drake in a pond in Danbury, Conn., Jan. 2016. Here’s my latest For the Birds Column about a Northern Pintail drake I saw last week. Exciting sighting! These are the moments nature photographers hope for. Every once in a great while you come across a bird you really want to photograph and the subject is extraordinarily brave, cooperative and within reach of a zoom lens. Sometimes you even have your camera handy when those moments come around. Such was the case last weekend when I drove past a pond in Danbury. The pond was small and nearly butted up against the road. I glanced over at the pond, as I always do, and this time saw a most welcomed visitor among the usual Mallards. A lone Northern Pintail drake swam among the greenheads, appearing indifferent to the cars driving past on the fairly busy road. I found the nearest safe place to turn around. I drove past the pond again, this time on the opposite side of the road, and confirmed my initial identification. I turned around yet again and pulled onto the shoulder as far as I could next to the pond. The Mallards — two males and two females — and the pintail all stayed put and ignored me. I already had the passenger’s side window down and the radio turned off. Actually having my trusty camera with me, I go that out and started photographing the duck. This entry was posted in Ducks, For the Birds column and tagged Northern Pintail, pintail, pintail drake by Chris Bosak. Bookmark the permalink.